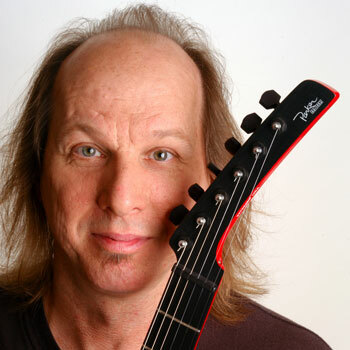 Guitarist Adrian Belew has had a long and staggeringly impressive career. With one foot in the progressive world and the other firmly planted in mainstream pop, he’s played and toured extensively with David Bowie, Frank Zappa, Talking Heads, Nine Inch Nails and many others. He was guitarist and primary vocalist for rock legends King Crimson for 33 years. Belew has also collaborated with avant garde musician Laurie Anderson, synthesizer giant Jean-Michel Jarre, Herbie Hancock, Béla Fleck, Cyndi Lauper, Mike Oldfield, Paul Simon and even Star Trek star William Shatner. He fronted arty powerpop group The Bears, with whom he released four studio albums and two live sets. And amid all that activity, he found time to release 16 solo albums and 3 live discs, and to develop an interactive music app called Flux. What that means in practice is that the Adrian Belew Power Trio can reinterpret some of King Crimson’s most challenging material – some of which was originally played by six musicians – and present it in a manner that’s at once faithful to the original and adventurously new.